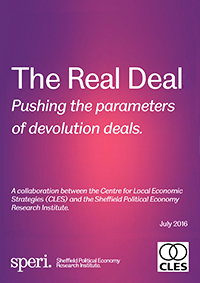 A new joint report ‘The Real Deal: Pushing the parameters of devolution deals’ published today by SPERI and the Centre for Local Economic Strategies (CLES) calls on the new government to reset the devolution agenda, rethink UK governance at all levels, and presents ideas for a new settlement to make devolution a force for progressive change. The paper – co-authored by SPERI’s Deputy Director Craig Berry, Policy Research Officer Tom Hunt and researchers from CLES – outlines new ideas for future devolution deals in eleven policy areas: employment policy, transport, energy and environmental policy, housing and land use, health, procurement, local banking, higher education, lottery funding and the democratic process. “As a new government takes office this is a valuable opportunity to reset the devolution agenda in the UK. Bold new ideas to push the parameters of devolution deals are needed and we want this report to be taken up by mayors and combined authorities, new Ministers and the public. Download the report The Real Deal.